For most of us, 1917 reminds us a year in the terrible World War I. While European scientists were on the battlefront, in America, their colleagues away from the frontlines were pursuing their research. For astronomy, 1917 was a year of reckoning. 1917 when astronomers got a grasp that our Milky Way was one of numerous giant stellar systems, and that a multitude of similar “island-universes” or galaxies, still named nebulae, were scattered at colossal distances from each other. Astronomers were still trying to distinguish them from the much smaller clouds of fluorescent gas such as the Orion Nebula. The finding came from two lines of evidences, observation of extragalactic ‘novae’ and measurement of spirals receding from the Milky Way at very high speed. Supernovae (star like objects indicated with arrows) in the spiral galaxy NGC 4321 identified by comparing two images, one obtained in 1901 and the other in 1914. From Curtis (1917), Lick Observatory Bulletins. Using the new powerful 60inch reflector telescope at Mount Wilson Observatory in California, George Ritchey (1864-1945) was searching for variable stars in ‘nebulae’, stars whose brightness varies over a short period of time. Photographing ‘nebulae’, he found a relatively rare type of explosive stars, novae. Novae were well known and several had been observed in the Milky Way over the previous decades. The nova brightening is triggered by the dumping of material from a red giant companion onto a white dwarf, igniting a catastrophic nuclear detonation at the surface of the receiving star. The rapid brightening lasts for a few weeks. Hence novae could be registered on photographic plates taken only weeks apart. Although he could not then know the nova mechanism, Ritchey correctly declared novae to be as numerous in the Andromeda Nebulae as they were in the Milky Way, about a dozen events a year. The objects appeared very faint, he explained, because of their much greater distances. He also found other spiral ‘nebulae’. Ritchey assumed they were analogs of novae in our own Milky Way, scaling for their difference in brightness, he derived distances to the host systems to be millions of light-years! This put spirals far beyond the Milky Way. A bit more to the north, the mountain site of Lick Observatory on Mount Hamilton in Santa Clara County, California also offered fine observing conditions. Heber Curtis (1872-1942) had been conducting a systematic survey of the sky with a new wide field photographic camera installed on the Crossley 36inch reflector. The Crossley camera covered 0.9 degree at once, a field of view almost 10 times that of the apparent size of the Moon. With only a few areas of the sky observed, the deep photographs revealed thousands of spirals. Curtis was aware of ‘novae’ in spiral galaxies. The procrastinating Ritchey did not immediately proceed with publishing his findings. Curtis did otherwise, rushing to the 36inch photographic plate archive of spirals, Curtis found several more novae. He quickly prepared and published his results before Ritchey managed to do so. 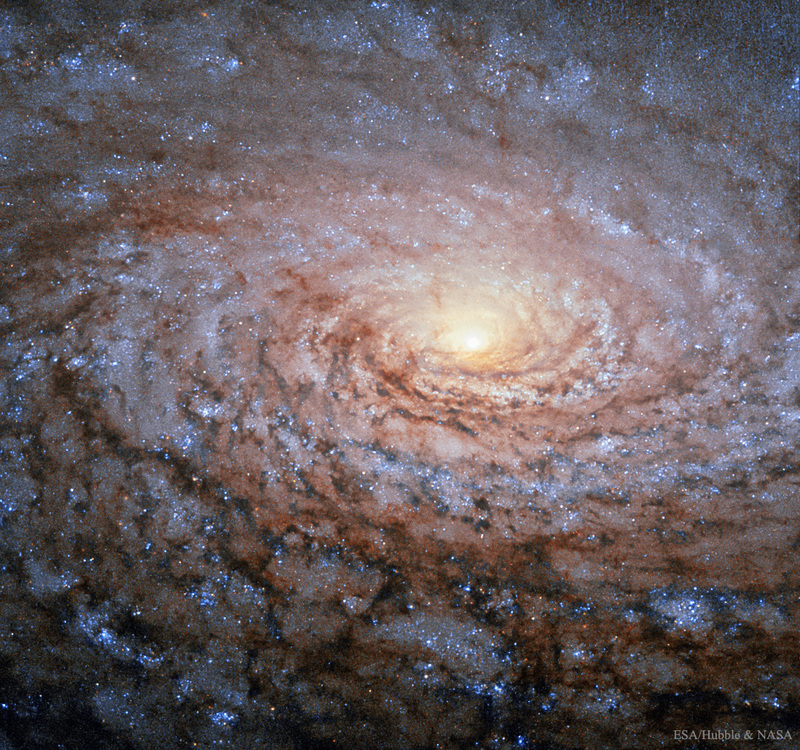 Curtis argued that the spirals were twenty million light-years away and sixty thousand light years in diameter. Curtis and Ritchey’s papers were both published in 1917 . The “novae” observed by Ritchey and Curtis were not all the same. Novae observed in the nearby Great Andromeda Nebula were novae like those observed in the Milky Way. Those in the other spirals were actually supernovae, much more powerful exploding stars. Rudolph Minkowski (1895-1976) and Fritz Zwicky (1898-1974) established their nature in 1941. 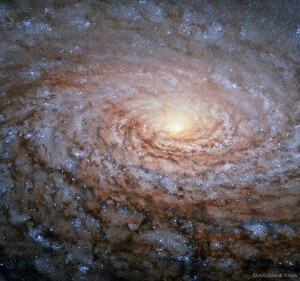 The beautiful spiral galaxy Messier 63 at 27 millions light-years away photographed with the Hubble Space Telescope. ESA/NASA. With novae paving the way, another independent direction of study led to distance determinations that also put most ‘nebulae’ well outside the boundaries of the Milky Way. In a splendid paper published in 1917, Vesto Slipher (1875-1969) reported on the velocities he had derived from the spectroscopy of several ‘nebulae’. Slipher’s observations were the results of a painstaking and relentless program using the 24inch refractor at Lowell Observatory, Arizona. Slipher was as patient as he was quiet, persistently piling up multiple nights of exposure to get twenty to forty hours of photons trickling on each photographic plate. He derived the movements of the ‘nebulae’ with respect to the Milky Way. What Slipher found was phenomenal. A few objects like the Great Andromeda Nebula were moving towards us. However the majority (17 out of 21) were receding at high velocities, in some cases reaching 1100 km/second. At such speeds, they could not be retained by the gravity of the Milky Way. Slipher wrote: “It has for a long time been suggested that the spiral nebulae are stellar systems seen at great distances. This is the so-called ‘island universe’ theory, which regards our stellar system and the Milky Way as a great spiral nebula that we see from within. This theory, it seems to me, gains favor in the present observations.” These key findings of 1917 led to further developments. The brilliant Estonian astronomer Ernst Öpik (1893-1985) undertook a different approach. Employing some simple and clever assumptions about how starlight related to stellar mass, in 1922 he derived the distance to the Great Andromeda Nebula to be about 1.5 million light-years. This value is the closest to the modern one of 2.6 million light-years. In 1924-25, Edwin Hubble used the most accurate distance indicator, Cepheid variable stars, to establish distances to galaxies with an unprecedented accuracy. This is another story. H. D. Curtis, Three Novae in Spiral Nebulae, Lick Observatory Bulletins, Number 300, 1917, pp. 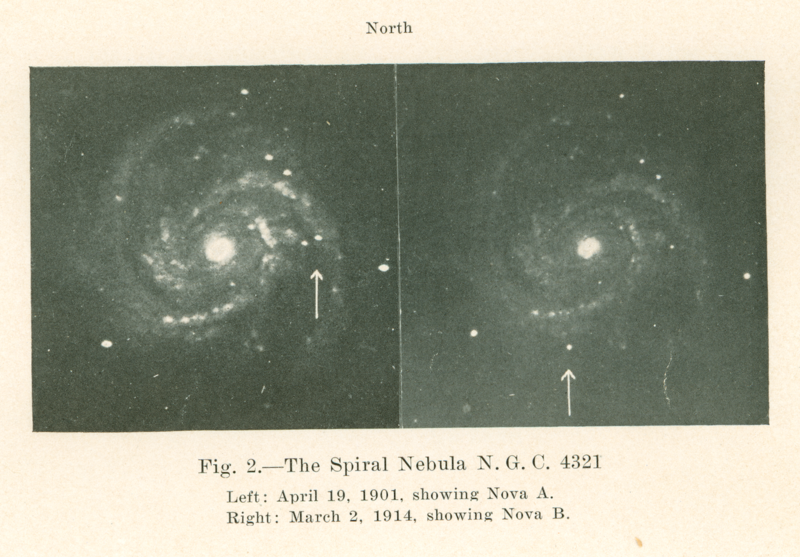 108-110; G. Ritchey, Novae in Spiral Nebulae, Publications of the Astronomical Society of the Pacific, 1917, Vol. 29, pp. 210-212. V. Slipher, Nebulae, Proceedings of the American Philosophical Society, 1917, Vol. 56, pp. 403-409.